CLICK HERE OR CLICK ON THE LINKS AT LEFT TO VIEW/ORDER PRODUCTS. If you do not see what you are looking for on this website, Savon Medimart offers a wide selection of products available in our stores or on a special order basis. A CPAP (Continuous Positive Airway Pressure) machine is the most common therapy for sleep apnea patients. You must have a physician’s prescription in order to obtain a CPAP machine. Savon Medimart offers supplies, masks & tubing, and other items that DO NOT require an RX to maintain your CPAP machine at affordable prices. From Bathing Aids to Household items, Savon Medimart has hundreds of items to choose from. Many essential products that make every day tasks easier. Shoe horns, elastic shoe laces, zipper pulls, sock aids, lotion applicators, foot rests, key turner, leg lifter, pill dispensers, tablet crushers, threading helpers, reachers, specialty eating utensils, gait belts, magnifiers, bibs, swivel seats, to just name a few and many more. Accidents in the bathroom are a leading cause of injury. Savon Medimart carries all the items you need to make your bath a safer environment. Grab bars, shower bench seats, raised toilet seats, commodes, transfer benches and more. Knee braces and wrist braces. Biofreeze® is the #1 used and recommended topical pain reliever by chiropractors, massage therapists, physical therapists, and podiatrists. Biofreeze® is an over the counter topical analgesic pain relieving gel used to provide temporary relief from minor aches and pains of sore muscles and joints. Many popular styles and colors of walking canes, including 3 & 4 prong canes for added stability (similar to the "Hurrycane®", folding canes, decorative, and more. Many styles of crutches from pediatric to bariatric. Adjustable aluminum commodes, coated steel, and accessories. Savon Medimart carries a vast assortment of seat and wheelchair cushions, lumbar support, and leg / knee cushions and pads. Pressure pads, low air loss, along with patient handling trapeze lifts and slings. 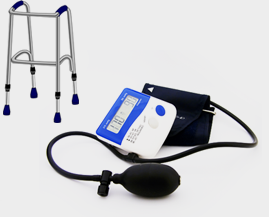 Blood pressure cups, stethoscopes, diabetic monitoring strips and tools. Many styles and colors to fit any decor and to make getting up very easy. Outside and inside vehicle lifts, vertical platforms, modular and portable ramps, staircase glides and lifts, and pool lifts. Portable oxygen concentrators and oxygen cylinders for home fill patients. Gait belts, slings, traction and pulley sets. In addition to squeeze balls and pedal bikes. 3 and 4 wheel power scooters. Portable and custom built ramps for wheelchairs, power scooters, rollators. Stair glides. Support hosiery by Juzo®. Many fashionable styles and colors available in knee highs, thigh high support stockings, support pantyhose and socks. Adult, pediatric, bariatric sizes. From standard transport to sport wheelchairs. Wrist supports, heel protectors, Sheepette® protectors.